Take a look at the sketch on our Rates & Resort Layout page and view the picture on our home page. 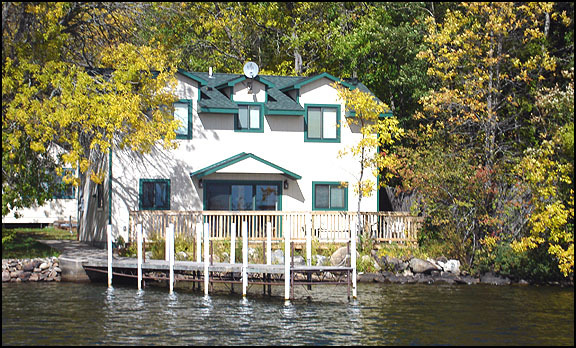 You'll notice the close proximity of the water to most of our cabins. The view is to the southeast so the early morning sun bathes our bay and warms the shorescape of Whispering Winds Resort. This picture was taken from the front steps of cabin # 1. All cabins have sundecks, deck furniture, electricity, heat, hot and cold running water, showers, cooking ranges, refrigerators, dishes and cooking utensils, microwave ovens, cozy bedrooms, blankets, sheets and pillows. and four bedrooms in #2. This is our "#3" Cabin. It features a fireplace in the living room, has two bedrooms, and will sleep six people. The living room in "#3" is quite spacious with its fieldstone fireplace that leads to the roomy dining area. This cabin now has a more open style kitchen, electric heat in the bedrooms, and a door out onto the deck. 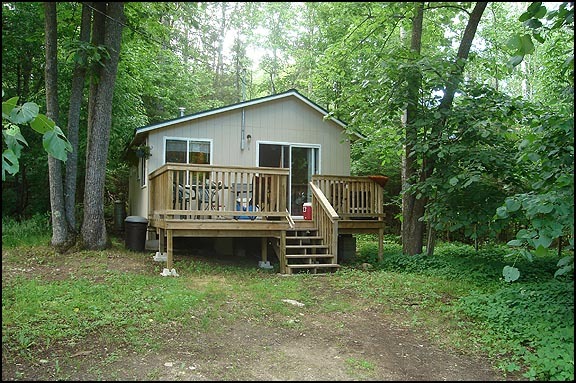 This 2 bedroom cabin (Cabin #7) was rebuilt in 2002 with larger bedrooms with electric heat, bathroom with 4' shower, kitchen with range hood and lots of cabinets, and a gas fireplace in the livingroom. Below is a picture of the interior of cabin #7. This is where Cabin 8 & 9 used to be and the new cabin # 8 with three bedrooms, sleeping 7 people is now ready for occupancy. It is wheelchair accessible with a roll in shower on the ground floor and second full bath and two bedrooms on the upper level. Check it out and see if it suits your summer vacation needs. HERE are some pictures of the cabin!